Ben Bartlett of YCO Sail writes in to say that his central agency for sale, the Nautor Swan 27.71m superyacht, DSK is currently on her way to Malta to take part in the Rolex Middle Sea Race. After this the sailing yacht will head to Palma to prepare for a crossing to the Caribbean to take part in regattas over there. 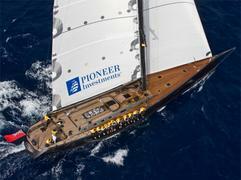 She's therefore available for viewings only for the last week of October in Palma. Built in 2008, DSK sleeps up to nine guests and is on the market at €8.95 million.